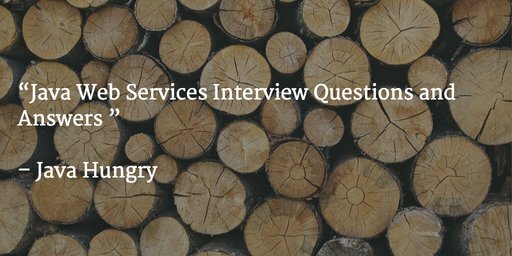 Web services interview questions are mostly asked in Software development Positions. We have already shared the frequently asked core java interview questions and tricky java interview questions. So below are the answers to the frequently asked web services interview questions. Q1 What are web services ? for example in simple words , when we call somebody so the person dialing and calling is the client application , while person receiving the call is server application and "hello" word is the protocol as similar to HTTP request . Q2 What is the difference between SOA and a web service? Q5 What is the difference between a REST web service and a SOAP web service? Q6 How to decide which one of web service to use REST or SOAP? “REST vs SOAP” we can rephrased to "Simplicity vs Standard". Of course, "Simplicity" with REST at most cases wins, it wins in performance, scalability and support for multiple data formats, but SOAP is favored where service requires comprehensive support for security (WS-security) and transactional safety (ACID). Q10 Can we send soap messages with attachments? Q13 What is a SOAP envelope element? Q14 What does a SOAP namespace defines? Q15 What is the SOAP encoding? Q16 What does SOAP encodingStyle attribute defines? SOAP encodingStyle defines the serialization rules used in a SOAP message. This attribute may appear on any element, and is scoped to that element's contents and all child elements not themselves containing such an attribute. There is no default encoding defined for a SOAP message. Q17 What are 2 styles web service’s endpoint by using JAX-WS? Q18 What is encoding rules for header entries? Q19 What is the wsimport tool? Q20 What is the wsgen tool? Q21 What is the difference between SOAP and other remote access techniques? SOAP is simple to use and it is non - symmetrical unlike DCOM or CORBA is highly popular and usually have complexity in them. SOAP provides greater platform independent with the language independence unlike DCOM or CORBA doesn't provide any of these. Q22 What is a resource in a REST? Q23 What are HTTP methods supported by REST? Q24 Whether can use GET request instead of POST to create a resource? Q25 What is the difference between PUT and POST? Q27 What are frameworks available to implement REST web services? Q28 What is the Restlet framework? Q29 What is the Jersey framework? Q30 What is the RESTeasy framework? Q31 What is the difference between AJAX and REST? Q32 What tool are required to test REST services? Q33 What does a @Path annotation do? Q34 What does a @PathParam do? Q35 What does a @QueryParam do? @QueryParam annotation injects URI query parameter into Java method. Q36 What does a @MatrixParam do? @MatrixParam are a set of “name=value” in URI path. Q37 What does a @FormParam do? @FormParam bind HTML form parameters value to a Java method. Q39 How to get HTTP request header in JAX-RS (2 ways)? Q40 How to download file in JAX-RS? put @Produces(“?”) on service method, with a Response return type. Instead “?” write a type text/plain, image/png, etc. set “Content-Disposition” in Response header to tell browser pop up a download box for user to download. Please mention in the comments if you have any doubts regarding java web services interview questions and answers.